Beautiful Homes Sell Faster than UGLY ones! Realtors and home stagers know all too well that a home’s appearance can be a determining factor as to how fast a home will sell… and at what price! This is especially true for kitchens and bathrooms. 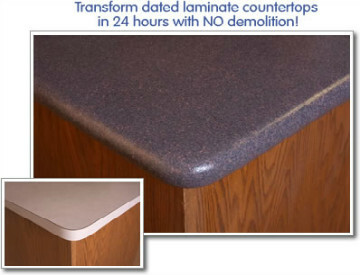 UGLY tub and tile colors or outdated, damaged countertops can become objections for home buyers. Even worse, UGLY baths and kitchens can kill a sale. In the current “buyer’s market, it’s even more important for a home to make a good impression and show well. More and more realtors and home stagers are turning to refinishing because Miracle Method’s unique process can update kitchens and baths in just 2-3 days. And refinishing saves a significant amount of time and money while avoiding the mess and hassle of replacement. 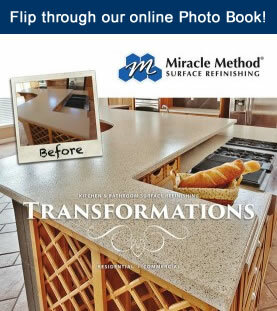 Miracle Method offers professional surface refinishing services that restores tubs, tiles, vanities, and countertops to a like-new look and feel, which will make a home appear as if it were “Designed to Sell.” Miracle Method’s work is guaranteed and the warranty is transferable to a new owner. Whether your client has a dated and damaged tub or has a vanity top in need of the “Wow” factor buyers are looking for, Miracle Method has the refinishing solutions your clients are looking for. We invite all realtors and home stagers to visit our website for more information. You can rely on Miracle Method to make your client’s tired kitchen or bath surfaces sparkle. It seems that people all across the nation are looking for affordable ways to improve the look of their homes. As more people are staying in their homes instead of trading up, they are making the investment to fix up their homes to more fully enjoy them. In addition, it is a well-known fact that renovating a kitchen or bathroom adds value to a home when it comes time to sell. As a result, the demand for home improvement services, such as refinishing services from Miracle Method, is dramatically increasing and this increased demand means now is a perfect time to start your own Miracle Method franchise! According to the U.S. Department of Commerce, about 45% of the $250 billion Americans spend annually in remodeling is spent on kitchens or bathrooms. Ugly tubs, tiles, and countertops represent thousands of dollars in opportunity for Miracle Method franchise owners and every building with a kitchen or bathroom is a prospect for refinishing! With the ability to refinish a wide range of fixtures, including all types of bathtubs; ceramic tile walls, showers, vanities, and floors; kitchen countertops such as Formica; fiberglass showers; as well as repair chips, cracks, and scratches, it is easy to see why Miracle Method is the nation’s leader in the refinishing industry. Every building with an ugly tub, countertop, or tiles is a prospect for Miracle Method's refinishing services. If owning a Miracle Method franchise sounds like the business opportunity you’ve been looking for, visit our website to learn more about owning your own franchise, or call 800-444-8827. We will give you all the support you need to ensure that your franchise is successful. We’re well into football season and we know there are many homeowners out there that are die-hard fans of their favorite NFL or college football teams. Now, you have the opportunity to really show your team colors, even at bath time! Changing colors has always been a benefit of refinishing and a specialty of Miracle Method’s. While most of our color changes are for traditional tile showers, bathtubs, or kitchen countertops, you can also refinish your tub in the colors of your favorite team! You’ll be the envy of the neighborhood with your one-of-a-kind design. Many of our Miracle Method franchisees have clawfoot tubs in their offices in the colors of their local football teams, and we could certainly do the same for you. Miracle Method offers a variety of color options, and with the ability to match any existing color or create nearly any color of your choice through custom colors, there are plenty of options to let you show your love for your favorite team. Below are a few photos from some of our Miracle Method franchise showcasing their team spirit! To learn more about the unique Miracle Method bathtub refinishing process, please visit our website. You can find a Miracle Method franchise near you by using our online locator.